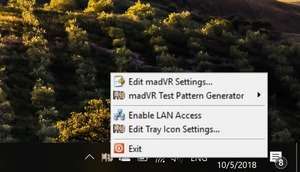 madVR provides the ability to obtain a higher image quality when playing video files is now possible with the help of the madVR software and a compatible multimedia player. Among the applications that support madVR as video renderer, the most commonly used are Media Player Classic - Home Cinema (MPC-HC), KMPlayer, J. River Media Center, Zoom Player and PotPlayer. For security reasons, you should also check out the madVR download at LO4D.com which includes virus and malware tests. Additional screenshots of this application download may be available, too.